The Arab-Hellenic Chamber is pleased to announce the convening of the 3rd International Waste Recovery and Valuation Exhibition (REVADE), Algiers, 8-11 October 2018, as informed by the esteemed Embassy of the Republic of Algeria in Athens. The Exhibition is organized by the Algerian Chamber of Commerce and Industry (CACI), with the National Agency of Waste. 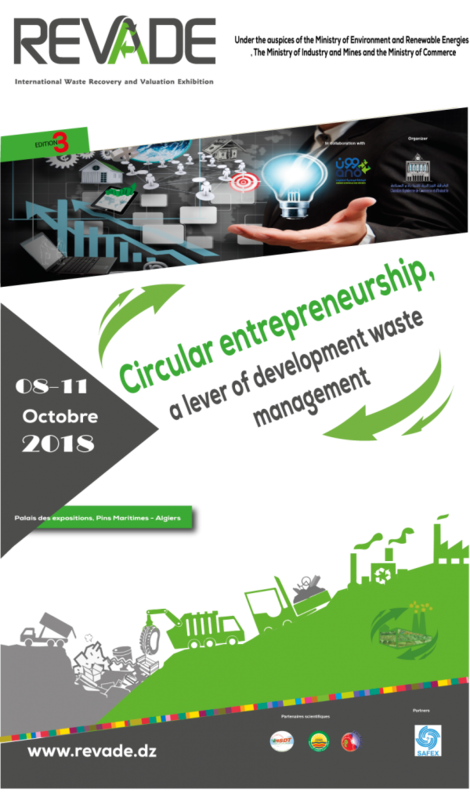 The exhibition will be held under the theme “the circular entrepreneurship, a lever for developing waste management” and it aims at promoting entrepreneurship in the field of recycling, recovery and waste processing, as well as encouraging investment and the creation of new companies, using the latest equipment and technologies.